I’ve always wanted to ride the Eurostar through the Chunnel Tunnel, but never had a good opportunity. 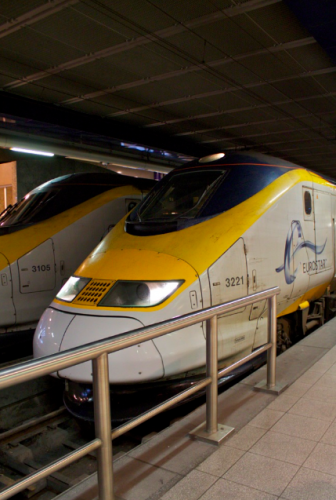 On our recent trip to London, I convinced Kristin to agree to a day trip on Eurostar to Brussels. In addition to the train ride (which was exciting enough to justify the trip for me), we also planned on seeking out three Brussels experiences: 1) mussels, 2) Trappist beer, and 3) chocolate. We actually accomplished our goal, but in the end, the trip was way more stress and hassle than it was worth. 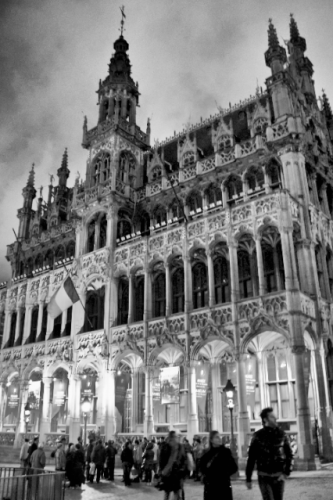 We didn’t finalize our decision to go to Brussels until just several weeks before our trip. Unfortunately, by this time, fares crept up and we ultimately needed to consider price in our train selection. We opted for the 10:57am departure from London, putting us in Brussels at 2:05p (2 hour train + 1 hour loss due to time zone change) and the 6:56pm departure from Brussels, putting us in London at 7:57pm (2 hour train ride – 1 hour gain due to time zone change). Ideally, we would have chosen an earlier departure, but it was too expensive at the time of booking. We ended up paying £89 per person round trip for the train trip. Upon arrival in Brussels, we set out for the center of town, which surrounds the picturesque Grand Palace (photo on the left). Unfortunately, I didn’t realize that the Eurostar drops travelers at the Brussels Midi station, well outside the center of town, until we were nearly halfway there. We spent about 25 minutes walking in the rain to traverse the distance to the Grand Palace. We later realized that this journey is much more efficient by a train transfer to Brussels Central, which is included in the price of the Eurostar ticket and takes less than 5 minutes (with frequent trains). After taking in the Grand Palace, we opted to dine at Chez Leon, well regarded for their mussels. On the way, we passed through Restaurant Row, with overzealous restaurateurs chasing us away from our restaurants. After sitting down at Chez Leon, we ordered a starter of escargot in addition to individual orders of moules-frites (mussels & french fries). Although we always like mussels, we were a little disappointed that Chez Leon’s food was not spectacular, and Kristin actually disliked the celery included in the preparation of the mussels. Our next stop was the Delirium Cafe, which happened to be a block away, in search of a Trappist beer. After entering the cafe, we were informed that many of the specialty beers, including the much sought-after Rocheford beers, were only available downstairs. Upstairs, they have a great selection of beers on tap. We really liked the atmosphere upstairs, so we decided to sample what they had to offer on tap. 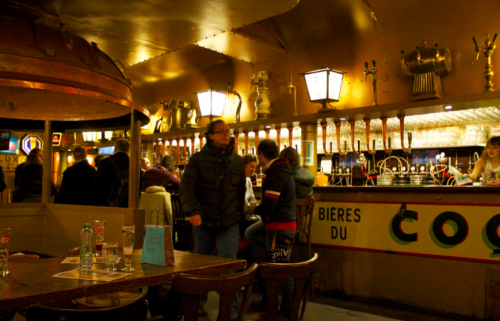 The upstairs of Delirium Cafe, with many beers on tap! I still managed to try a Trappist beer, the Chimay Triple, which they offered on tap. Meanwhile, Kristin tried a very unique green, wheat beer, called Floris Cactus. We finished with a special Christmas beer, the Delirium Noel, which despite being very alcoholic (10% ABV), was extremely drinkable. We could have stayed for a while (and in fact this experience was probably the highlight of Brussels), but we still had one more priority to check-off before our train departure: chocolate! 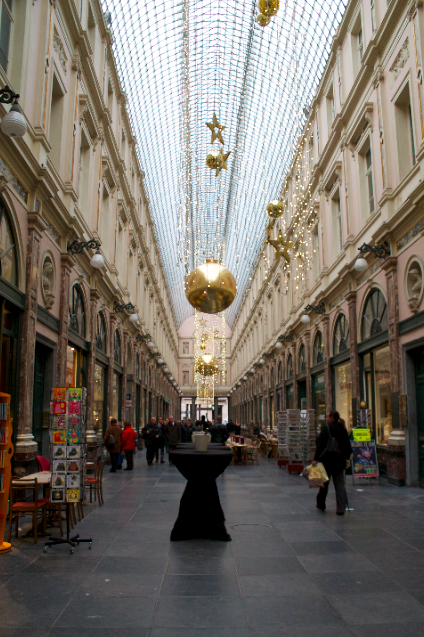 Many of the chocolate shops in Brussels are concentrated near Les Galeries Saint Hubert (see photo to the right), the covered mall near the center of town. After checking out several of the famous shops (we eliminated Godiva since it is so ubiquitous in the USA), we decided to taste some chocolates at Neuhaus. We were blown-away by several of the chocolates, including those flavored with hazelnut. We ultimately took home 2 boxes, which we have been slowly eating since our return home. We also found a small independent chocolate shop to grab a Belgian waffle with chocolate, and it was delicious! The quick train transfer from the much-closer Brussels Central train station to Brussels Midi was very slick, and we arrived with plenty of time to go through immigration (with a new passport stamp!) and board our train home. We slept nearly the entire way, arriving in London with an appetite for dinner on the way home. Ultimately, it was an interesting experience. However, London has so much to offer and we found ourselves wishing we hadn’t spent the time or money to go to Brussels. Most guidebooks recommend Bruges over Brussels as the place to visit in Belguim, but it’s just not feasible to make it that far on a day trip. Even with our regret, we can now say we’ve seen the capital of Europe, and I can check off my lifetime ambition of taking the Eurostar through the Chunnel. This entry was posted in Food, Things To Do, Travel and tagged Belgium, Brussels, day trip, Europe, experience, London 2012 Trip, UK by Ryan. Bookmark the permalink.